The Screaming Pope: Donald Trump's "Extraordinary Rendition"
At what point will the Trump phenomenon reach for the stars, that is to say the Army-McCarthy hearings. 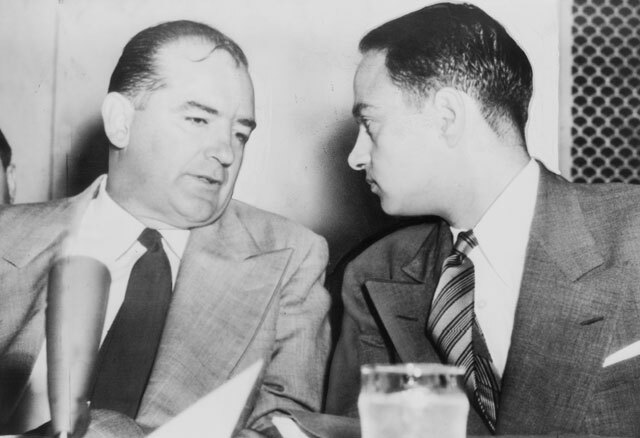 Joseph McCarthy, a Wisconsin Republican led a populist uprising based on red baiting. America was in the middle of the Cold War then. Now in the middle of the war against terrorism, Trump is trying to rout out Muslims like McCarthy did anyone who marched in the NRA (National Recovery Act) parade. People marvel at Trump’s ability to stir up emotions but he’s as American as Andrew Jackson or Louisiana's Huey Long who might have run for president were he not assassinated. On Monday Trump held a press conference in which he accused Jim Acosta of CNN of being “a beauty” and called ABC correspondent Tom Llamas “a sleazy guy” (“Donald Trump resorts to insulting reporter during heated press conference," The Week, 5/31/16). One of the techniques that demagogues use whether of the American or European variety (Hitler, Mussolini) is the harangue. They talk endlessly repeating the same points over and over again. In the case of the press conference in question, one wondered when Trump would scream "we will bury you" and pound his shoe on a lectern as Nikita Khrushchev did in a famous appearance at the UN. In this case, it was reportorial questions about his $6 million dollar fundraiser for veterans first promised in a speech given on the night of his boycott of a Republican presidential debate that provoked his ire. Haranguers also like to take on the role of the victim and in this case Trump could understand why no one would want to give, if they had to face scrutiny about their charitable commitments. He repeated over and over again that that they had raised $5.6 million but would probably exceed 6. Trump’s method is to repeat things ad nauseam and use them as a cudgel. It's a potent cocktail that has qualities of both domestic abuse and brainwashing, with the supposedly liberal press taking the blows. It was an “extraordinary rendition” to employ the term used to describe waterboarding and other extreme methods used by intelligence services to get information from the enemy. And here is a fishy little non-sequitur from The Times ("Donald Trump Soured on a Deal, and Hong Kong Partners Became Litigants," NYT, 5/30/16). The Times piece quotes, Abe Wallach, once Mr. Trump's executive vice president of acquisitions and finance on a meeting with some Chinese partners saying, "He didn't like the food, and couldn't use chopsticks. The first course was a whole fish, with the head still on. You could see the face of the fish and the teeth, which really looked grotesque. The servant put the fish in front of Donald. Donald said, 'The honor belongs to Abe.' I took my chopsticks and began to pick at it."